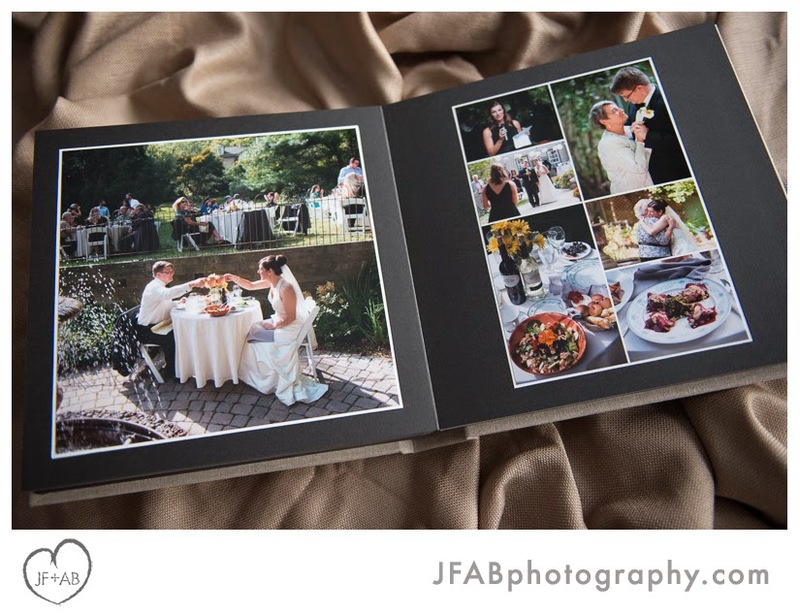 We were psyched to photograph two vegan weddings this year. 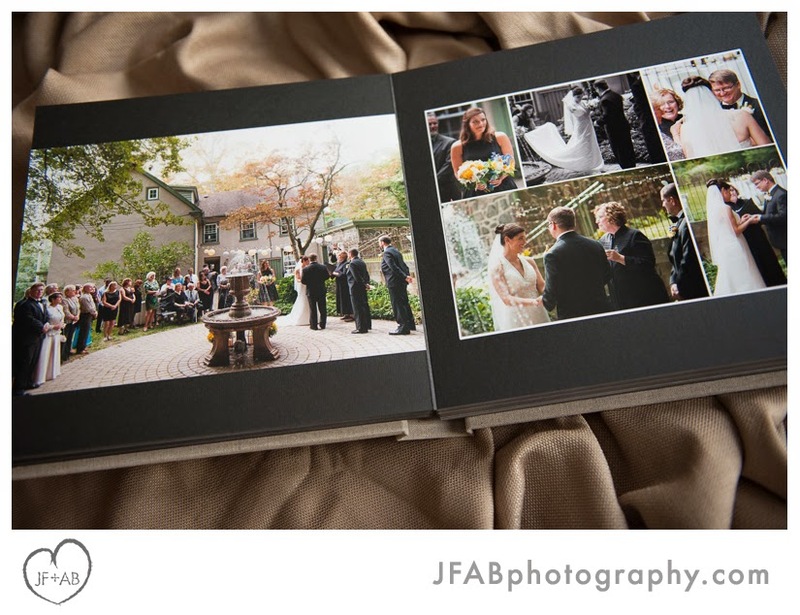 Featured in this entry are the wedding albums of Samantha and Mark and Lindsay and Paul. 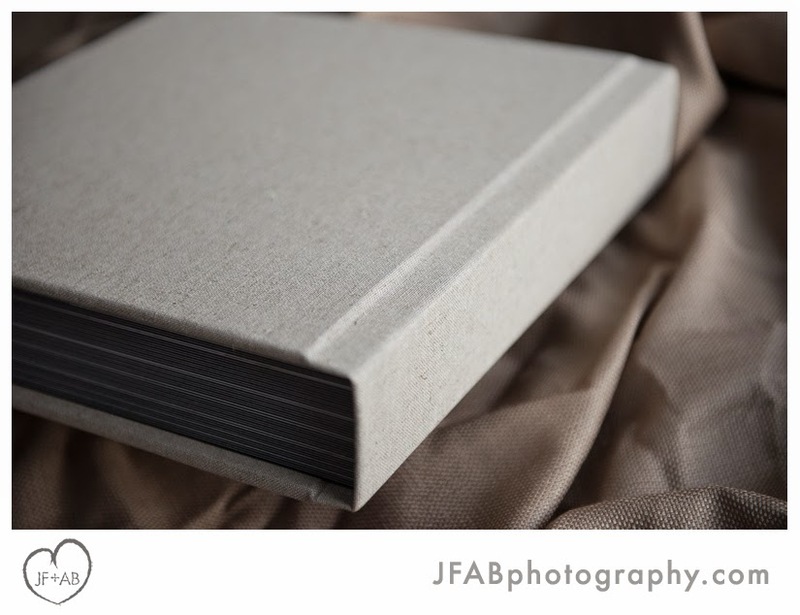 They both chose Leathercraftsmen's newest non-leather album cover material, the linen-like Countryside Book Cloth, which comes in Light and Dark. 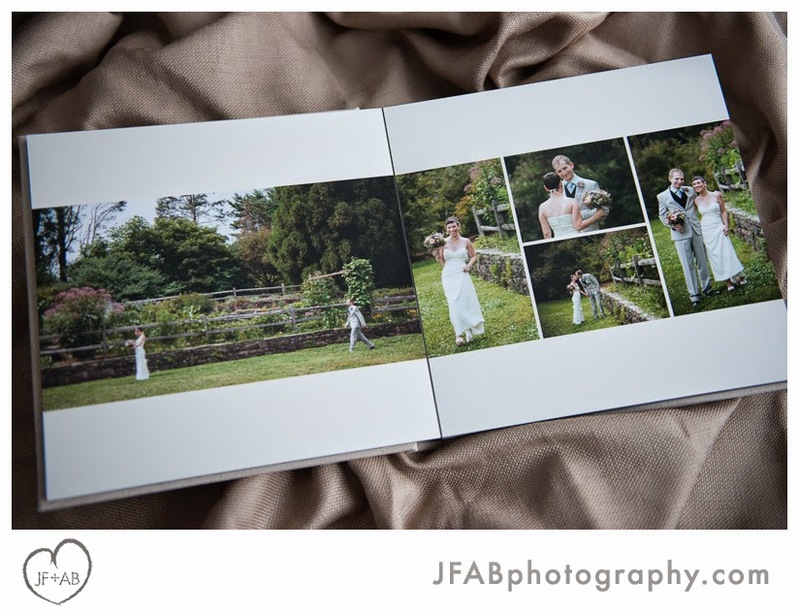 The two shades of Countryside Book Cloth are subtly different and having the two side by side was a nice opportunity to compare. 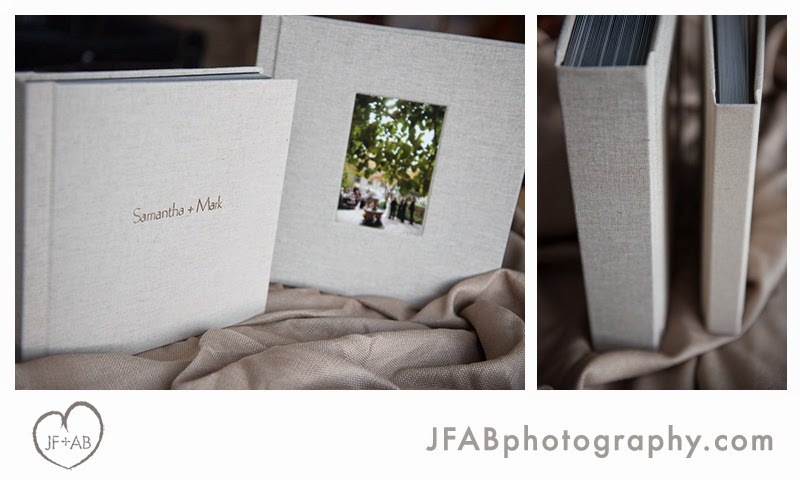 In the above photo, the Light cloth is shown on the two outer albums (Samantha + Mark) and the Dark cloth is on the inner books (the thicker book with the cover photo). 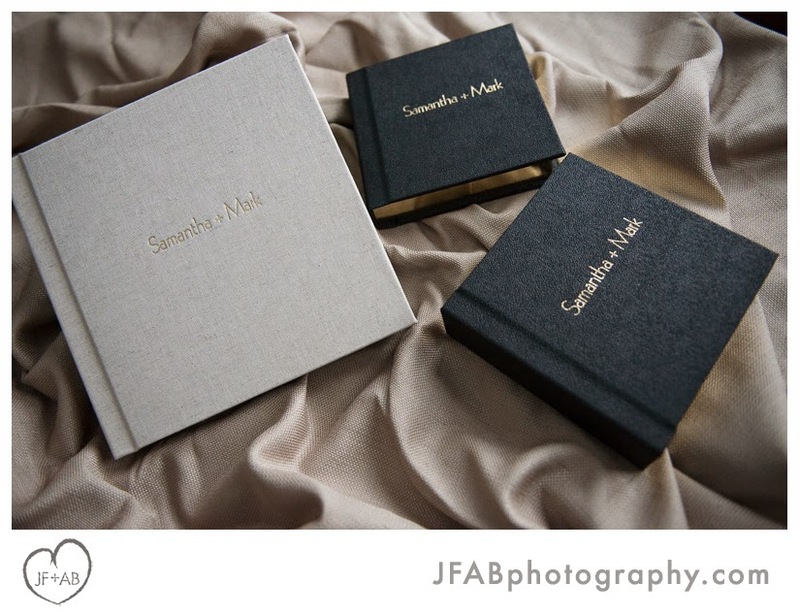 As an interesting aside, both albums have roughly the same number of pages - Samantha and Mark's slimmer 3500 series album actually has a few more (40 vs 38). 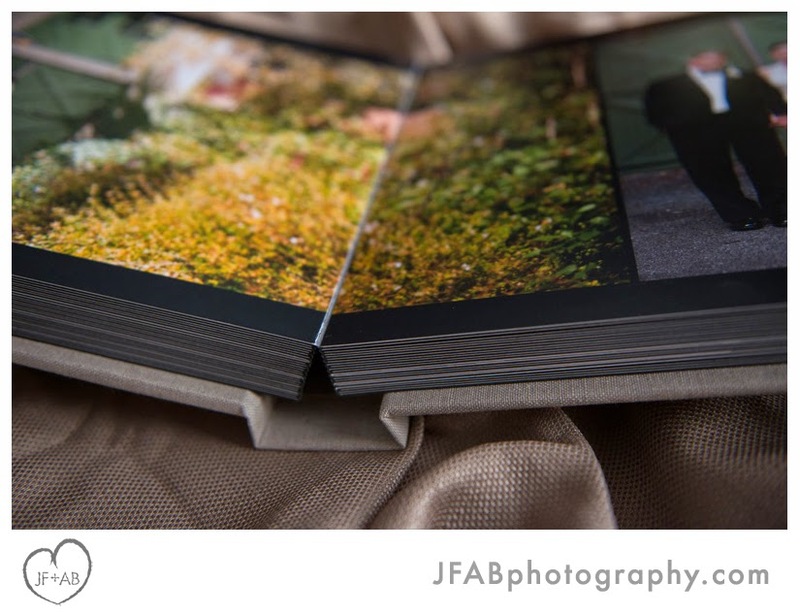 But Lindsay and Paul's album is the flush/matte hybrid 8500 series album and as such is significantly thicker. I'll make more notes on their albums below. Enjoy! 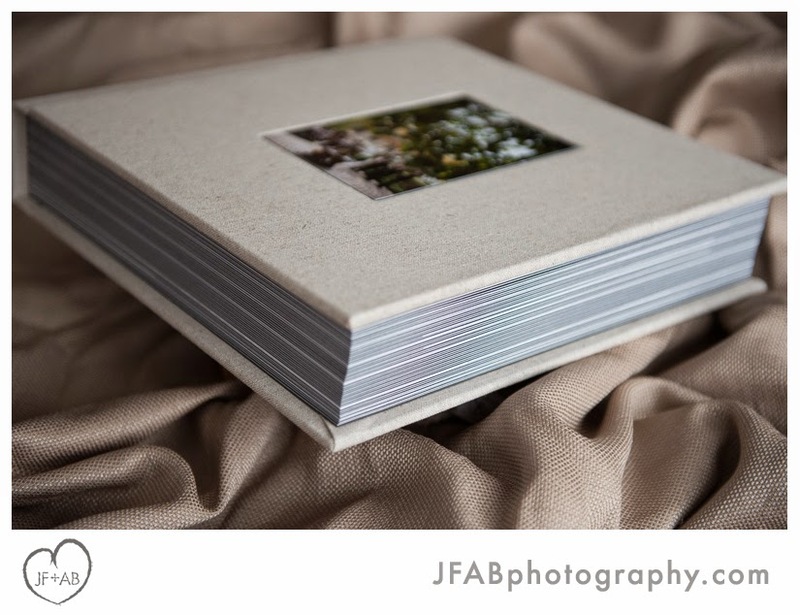 Lindsay and Paul's album is a 12x12 8500 with 38 pages. 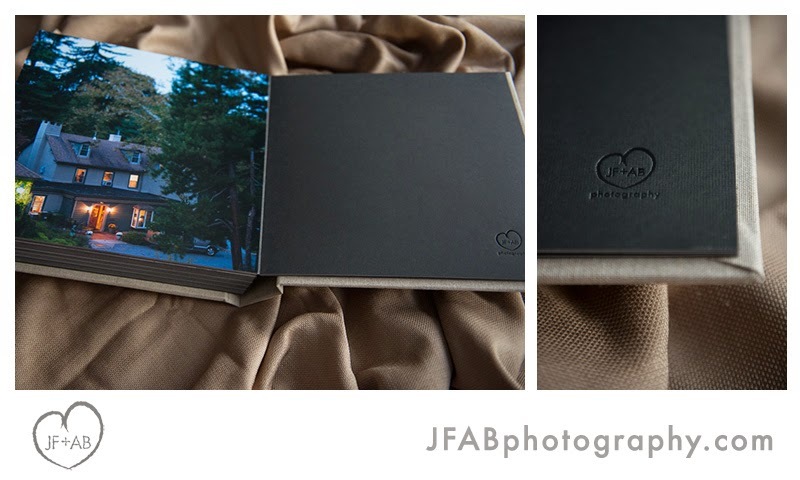 Like the 3500 flush, the 8500 flush/matte hybrid has square corners and a flat spine. 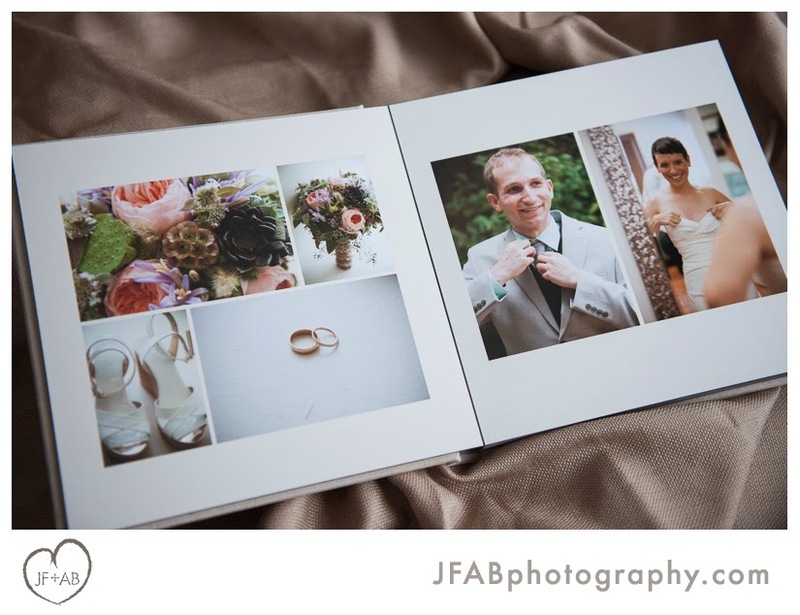 This album comes standard with gilding however Lindsay and Paul opted to skip it. 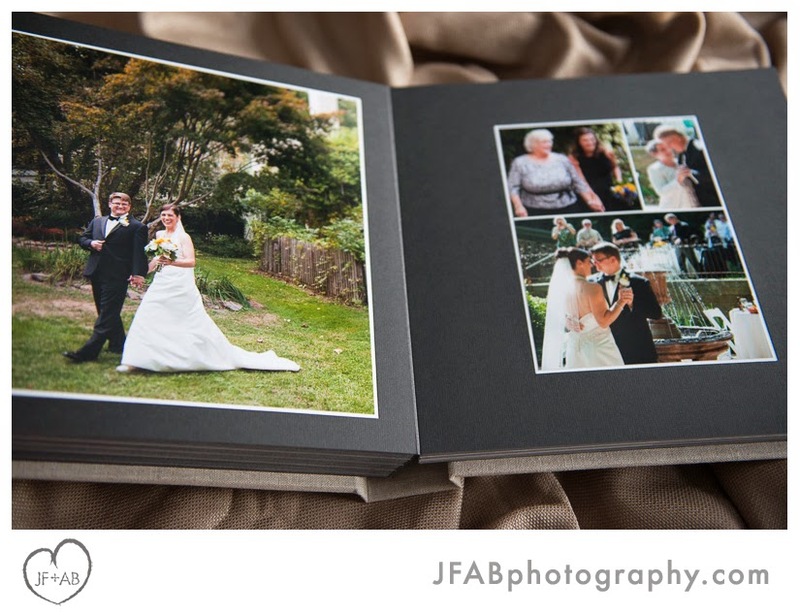 Each of these photos is mounted by hand to the matte with a liner framing the image. There are several matte and liner colors available. 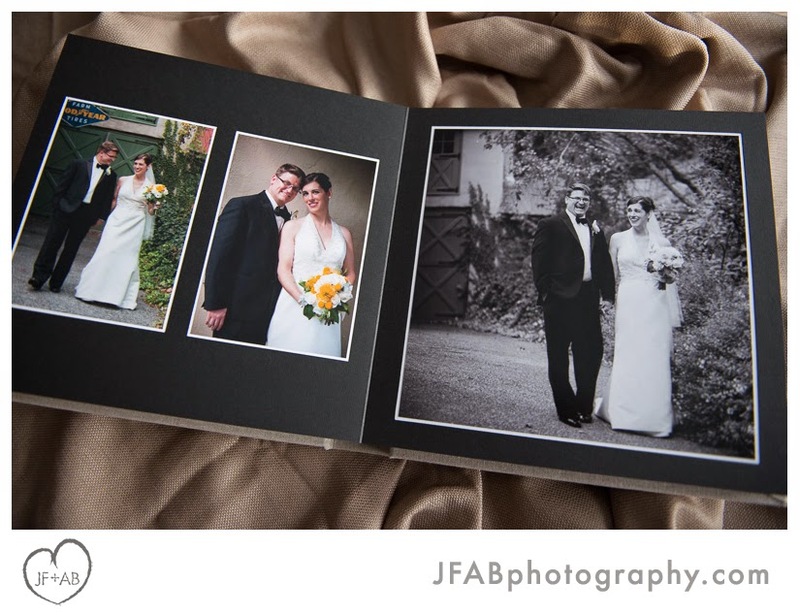 Lindsay and Paul chose classic black mattes with white liners. 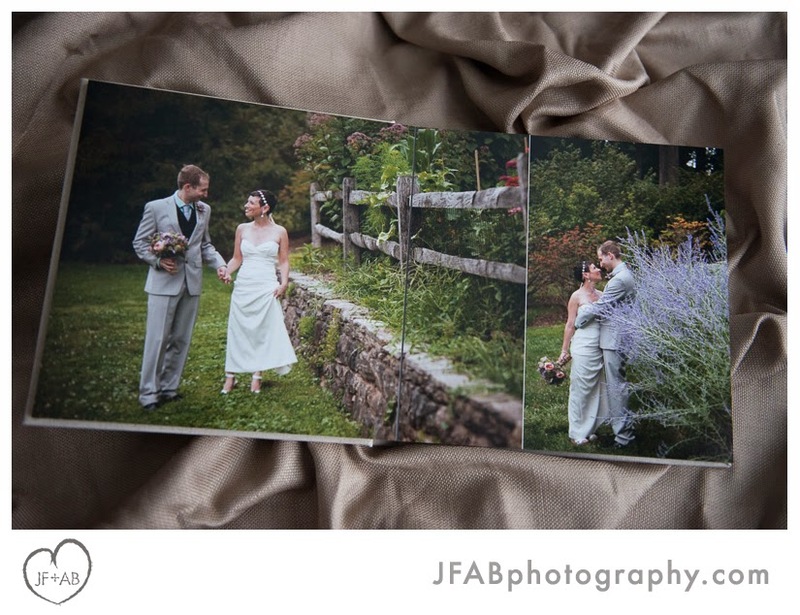 Although there are 5 images in this spread, these two pages actually only have two 8x10s mounted. 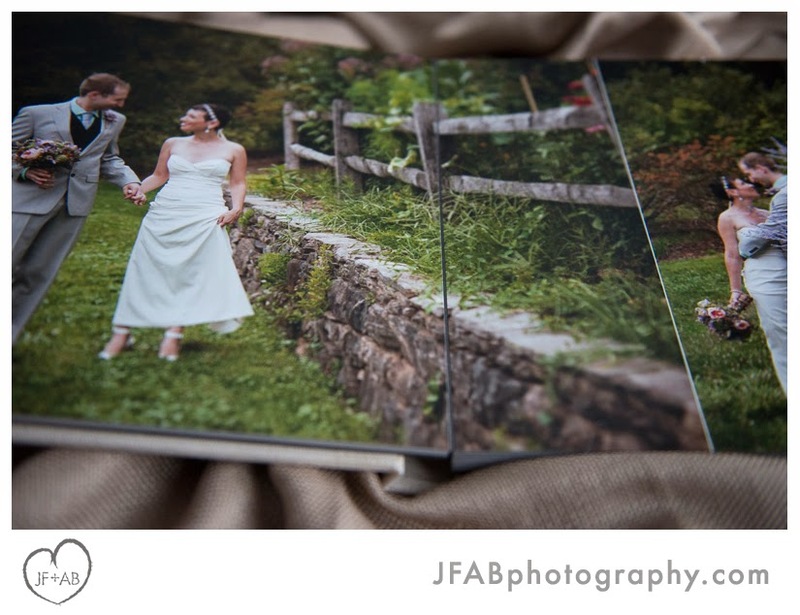 The print on the left is a collage. 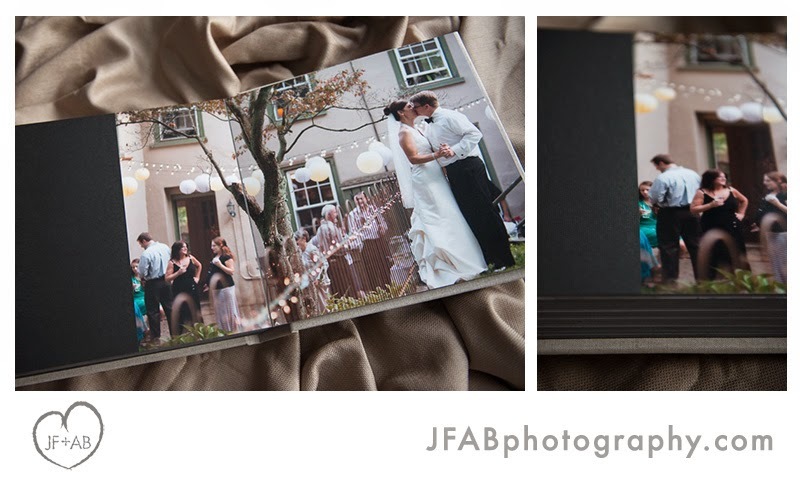 In this spread, there is a collaged 8x10 on the right and a letter box 8x12 print on the left. 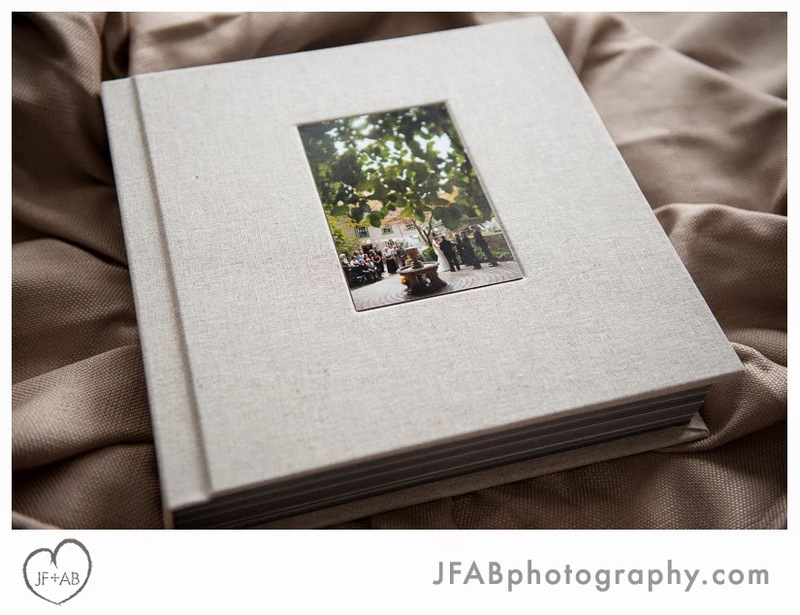 Letter boxes are among the "special mount" options available in this style of album. 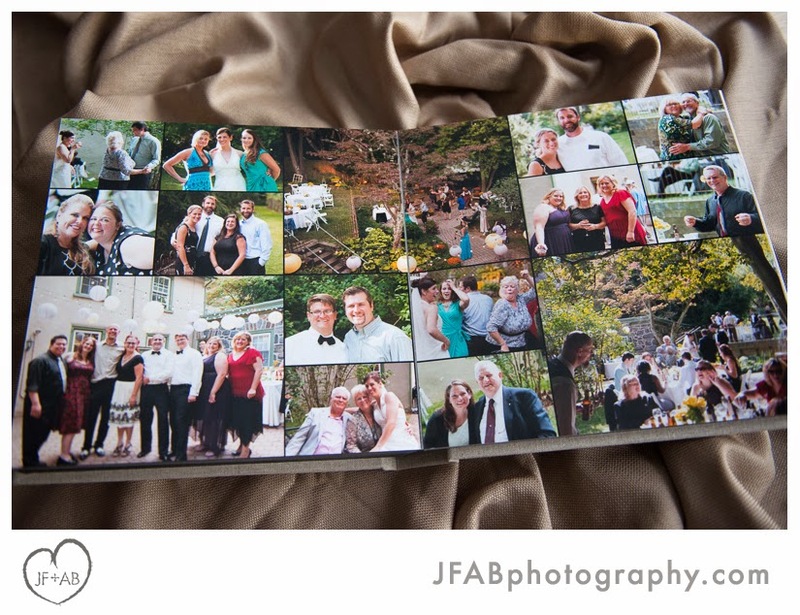 This spread is a flush full panorama, meaning there is no visible matte. You are looking at a 12x24 photo. 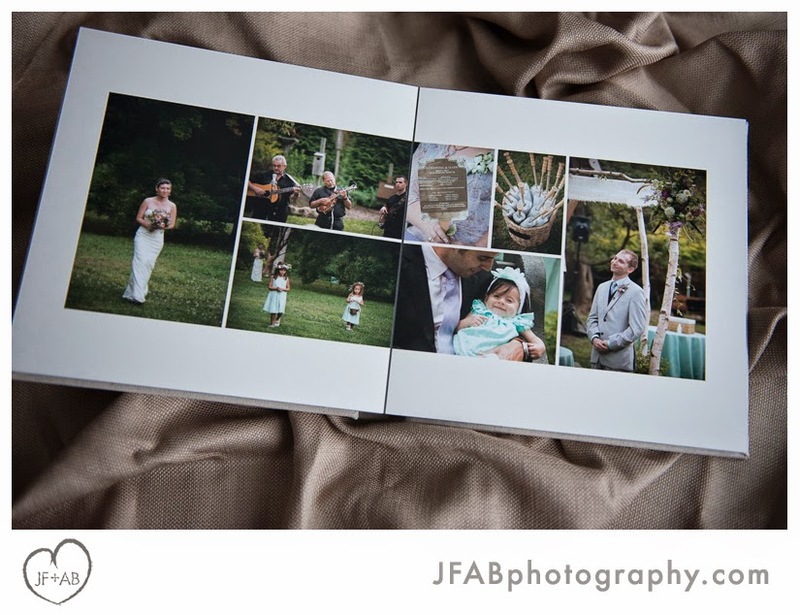 Although this album has the option of traditional-feeling matte pages, the binding is the same as the more modern feeling flush mount albums. 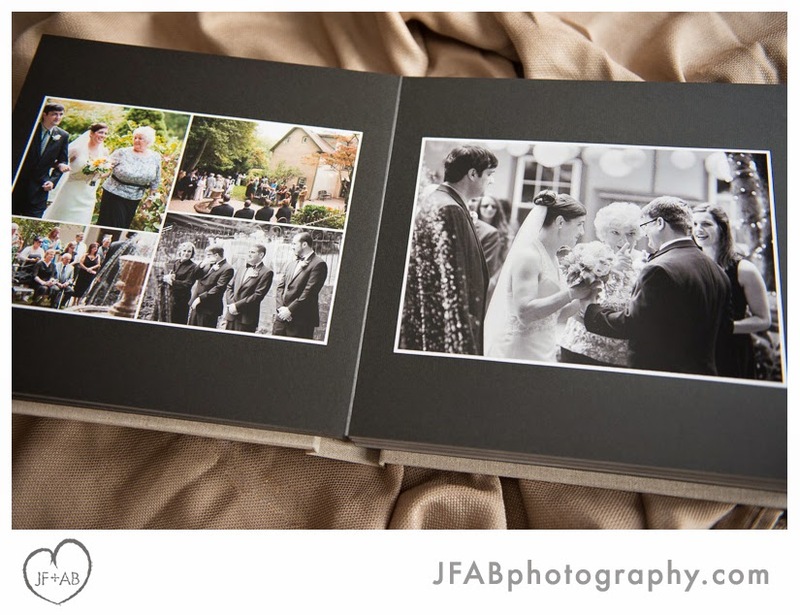 A collage spread toward the end of the album is a great way to work in favorite shots of guests. 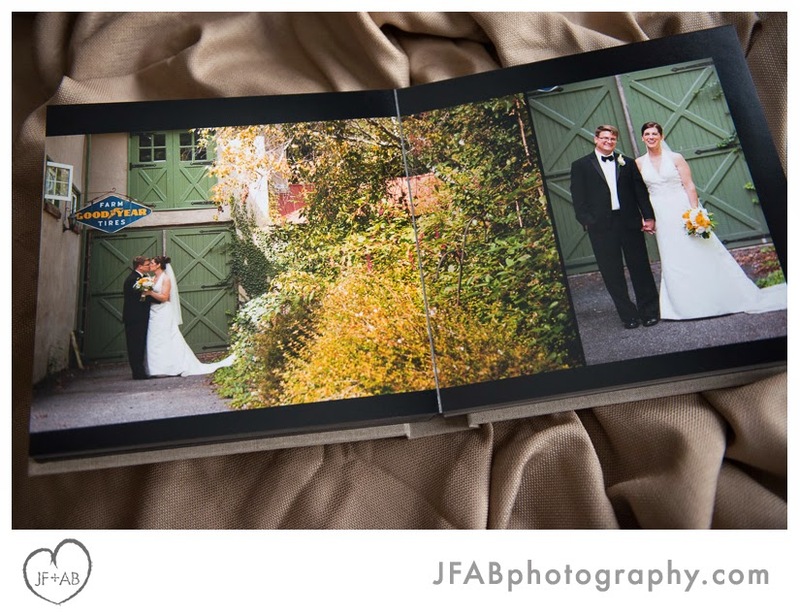 This is another "special mount" option, a 3/4 pano. The black strip at the left is an exposed matte. 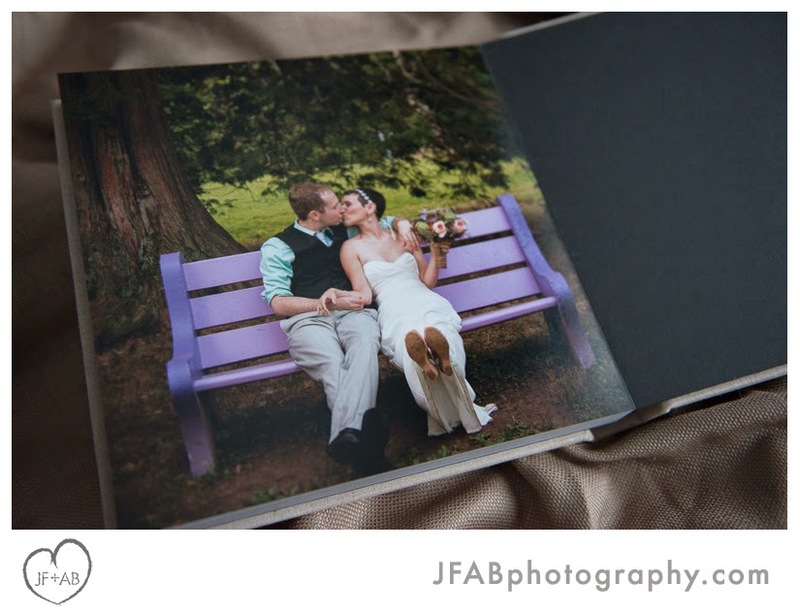 Since there was no other cover imprinting, we tucked our logo snuggly on the last page instead of on the rear cover. 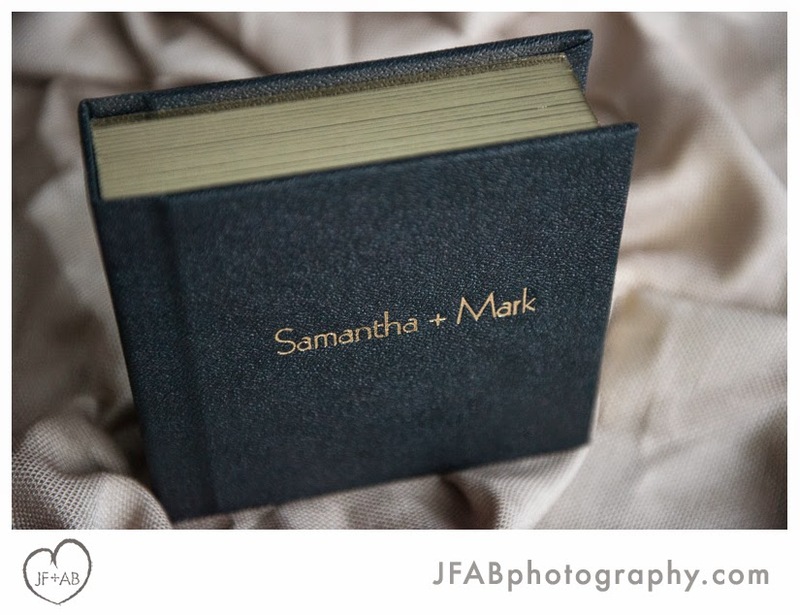 Samantha and Mark's album is a 10x10 3500. Their two parent albums are 7x7 8500s. 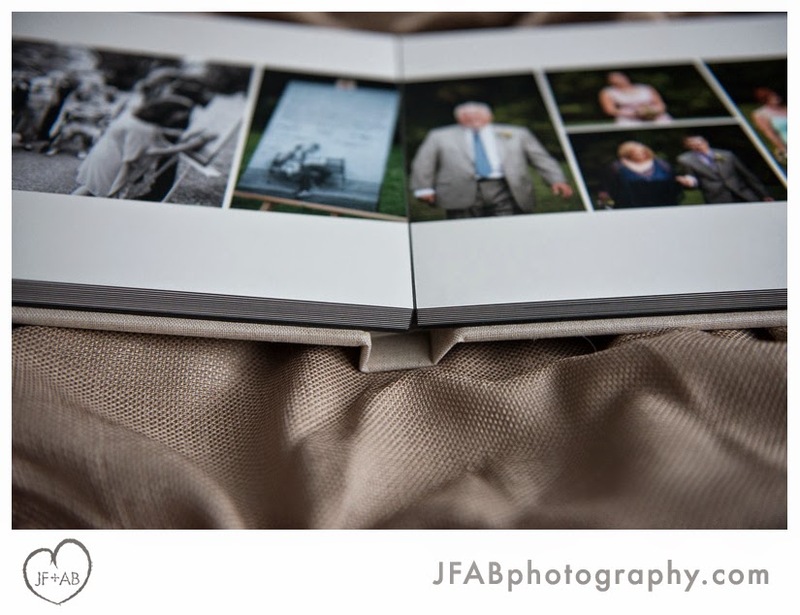 The parent albums are the flush/matte hybrid 8500 series albums. In this order, there were no flush pages included. 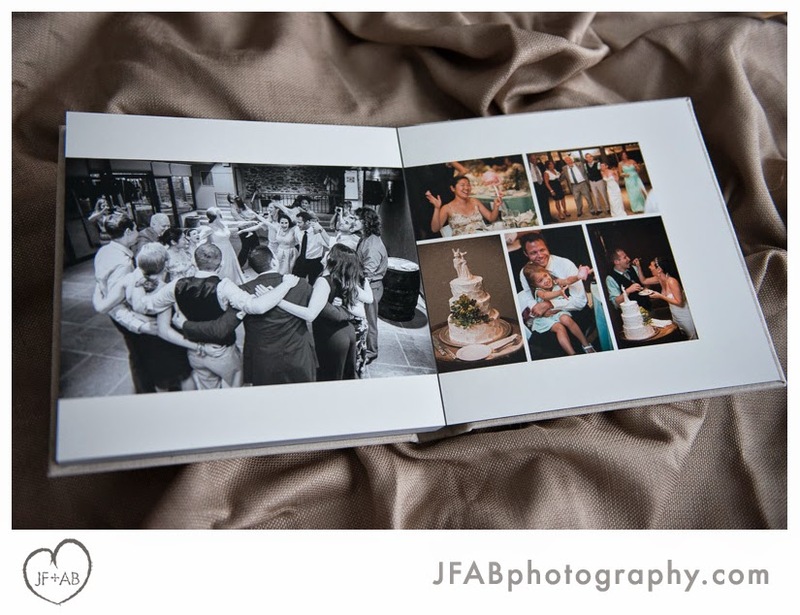 However, choosing this style kept the binding style consistent with the modern feel of the 3500 and allowed their parents to choose the photos they wanted in each album. 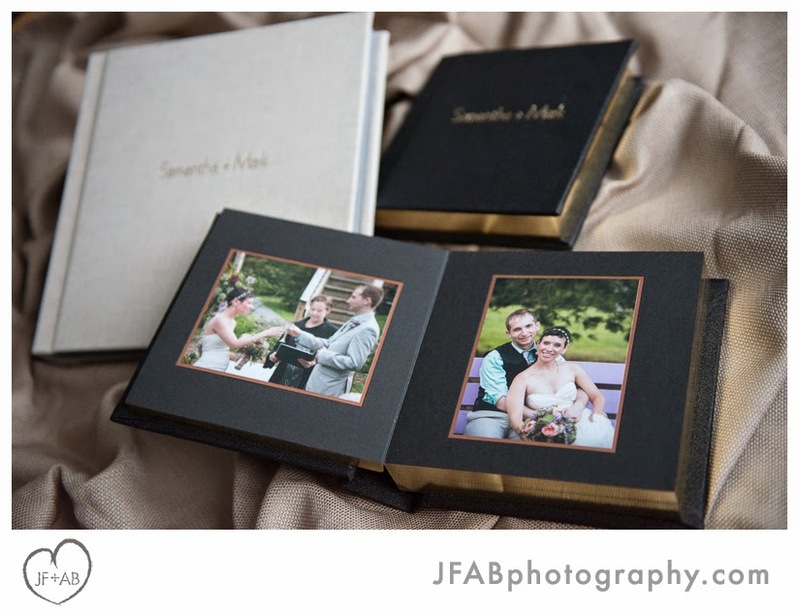 The parent albums are covered in the Black Natural Book Cloth with gold imprinting and gilding. 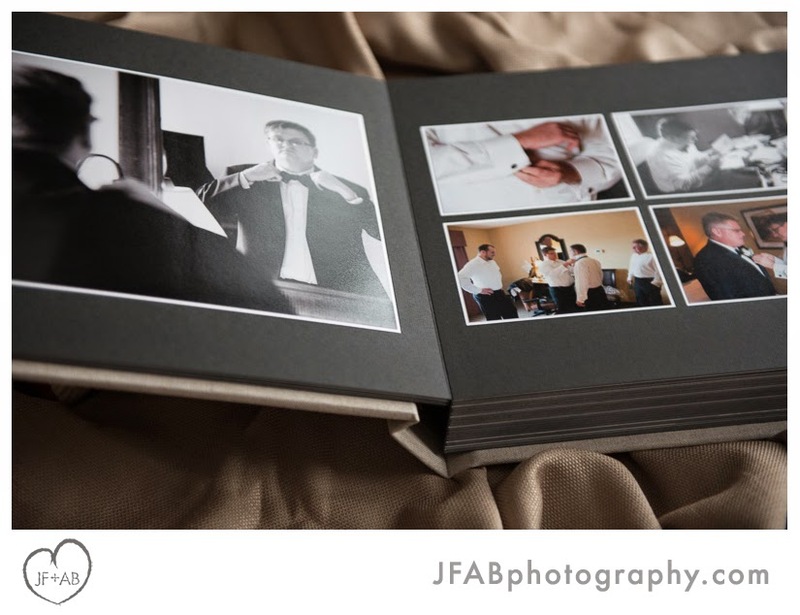 Every spread in this album is a 10x20 print with no visible matte.